Hello? Anyone? I’m still here! There’s lots to talk about, so let’s get started! The gentle reader of this blog might remember that I’m currently working on my thesis project. Although it changed quite a bit since the last time! The basic idea is pretty much the same. For example, the experience is still focused around the feeling of loneliness. It’s still set in space. And we still have this little fella here. By now I simply call him Naut, so that it doesn’t matter if he’s an astro- or a cosmo- or a taiko- or whatevernaut. Simple character design for easier animation. Our hero is still lost in outer space after his vessel got destroyed in a crash. But here’s where the differences begin. First thing first, there’s no planet anymore. In fact, there’s no interactable ingame object that could resemble earth or life in general. By taking away these familiar elements and exposing the protagonist to the vastness of space itself, I increase the tension of the situation. I hope to achieve a similar effect gameplay-wise through limiting the player’s possible actions, while simultaneously simplifying the game’s rules. Sure, it might have been fun to run around the planet Aether-style, but I hadn’t figured out what I was supposed to do with the platformer mechanics or why they should exist in the first place. They didn’t have a function per se, they were just kinda there. 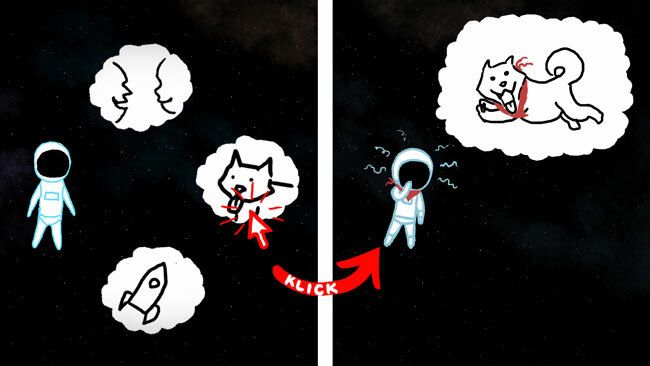 By letting the player have some quirky zero-gravity-fun, I would have undermined my original intention to make the player feel alone and helpless. The most important thing to reach this goal were Naut’s memories and thoughts, which transformed from an interesting side-feature to the core mechanic. So here we are. It’s all reduced to the very basics now. The whole thing evolved into a multiple choice point and click adventure. I see this project as a personal experiment to try out interactive storytelling in its simplest form (and maybe show off some of my animations along the way). 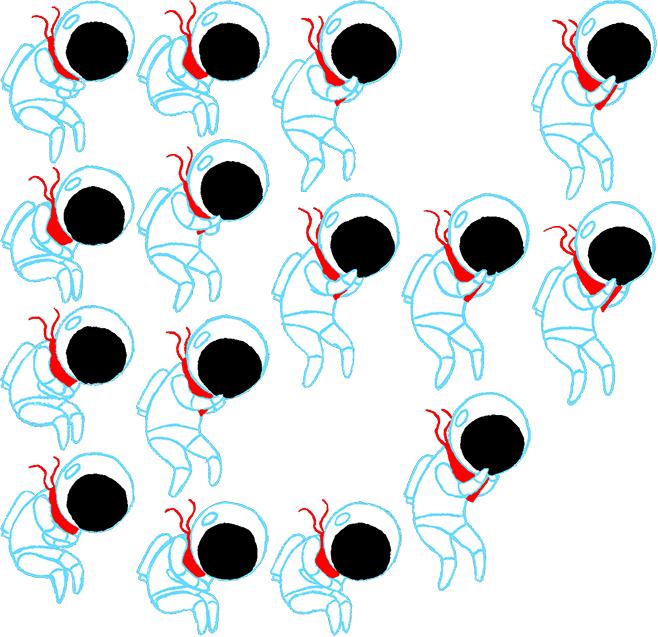 Since Naut is drifting through space all alone, there’s not much else he can do but think. A large part of these thoughts are memories of his life back on Earth. Through these you as the player have a way to get to know him on his journey into the black void. You decide, which memory he’s going to think of next, or which (limited) action he’s going to pull off. I won’t go into the specifics of his backstory for now, cause for me it’s important to see if I can pull it off to show instead of telling it. You see, all of it is being told completely through animation. There’s no speech or text in the game except for the credits roll and the main game menu. This gives me the additional challenge to make Naut’s background relatable and understandable through simple, functional animations that I have to communicate clearly to the player. Basic gameplay looks like this. This is followed by the next round of up to three choices. Rinse and repeat. Naut’s thoughts have a distinct effect on his psyche. It’s possible for him to go insane during the course of the game. Which ultimately leads up to one of three possible endings. 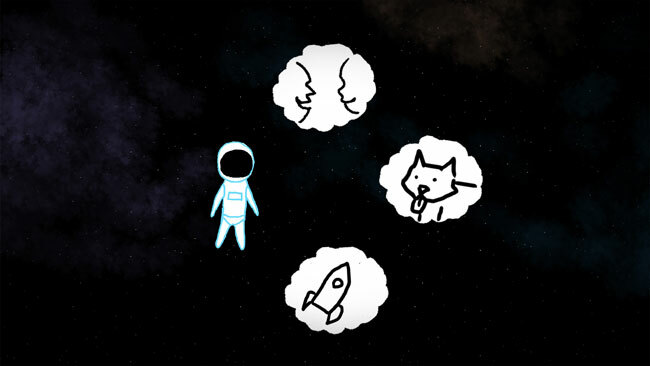 The consequences of a certain memory are communicated via changes in the soundtrack, his body language and an optical change in the space background. This is the basic sanity variable. The colored squares are story segments, or rather single memories. You can see the extremes at their respective corners. Mania is left, while depression is right. Optimal conditions are somewhere in the middle. At the most extreme level of insanity the player has the option to end it all. Yeah, it gets pretty dark. Now apply this variable to multiple rounds, where the player has the possibility to decide between up to three options. And there you have it. A branching storyline. This is my story tree, thanks to the amazing power of Google Docs. The magenta-colored line is showing the story branch I will present at my colloquium in August. The rest of the story segments will be there as a paper prototype. Technology-wise it’s going to be an HTML5 browser game first. Considering the simple mechanics, I could imagine, it’d work on mobile devices as well. But the browser-based prototype comes first. I’m animating frame by frame, using a tool called TV Paint. The most important argument for animating this way is that I get experience with the traditional way of animating. Also early tests with spline-based animation proved to be moving rather stiffly. Because of the fact that body language through character animation is an important way to communicate Naut’s condition to the player, I hope to achieve some nice and expressive keyframes by working with single frames. Naut can’t handle all those frames. So yeah. There’s still a lot to do. Lots of sounds, lots of code and lots of animations. Here’s a little After Effects mockup. Oh, and we’re still looking for a proper title. If you’ve got some ideas, shoot me a message.